Jeanette Kapus posing on the wing of an F-86 Sabre. Whether they were WACs, SPARs, WAVES, or WASPs, no witty acronym or cute nickname could belie the fact that women performed dangerous jobs across the country and around the globe during World War II. By 1945, there were women serving in every branch of the United States military, standing a remarkable 350,000 strong. Many of these women dedicated their time in the more traditional role of nurse; others offered their skills as clerical workers. Even though the original impetus had been merely to “free a man to fight,” it was greatly underestimated at the onset just how many of these women would be truly needed. Despite the ever-growing demand for men in active combat, the military remained cautious about what duties they would allow women to perform. It was only after the Europeans proved successful that some American service women were offered more mobility. This is particularly the case for the WASPs—Women Airforce Service Pilots—an elite group of service women who rose to a different challenge during the war. Unlike their other sisters in the military—who by this point were all recognized with reserves status by their respective branches—these courageous women put their lives on the line as civilians. Only a handful of female fliers like Amelia Earhart had ever garnered any significant attention, but over 25,000 women submitted applications to become a WASP. Only 1,830 were accepted to the elite program, and of them, only 1,074 made it through the rigorous program to reach graduation. 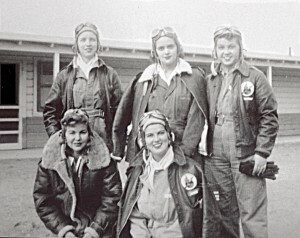 While their numbers were only a small fraction of the other branches of servicewomen, the WASPs lost 38 fliers during the line of duty – attesting to the disproportionate danger of their job. Even before war was officially declared, Milwaukee-native Jeannette C. Kapus had already set her eyes to the skies. Encouraged by her father, a World War I veteran, Kapus joined the Civilian Pilot Training Program in Davenport, Iowa in July of 1941. She was already working as a clerk stenographer at the Rock Island Arsenal in Illinois just across the river from Davenport, making it possible for her to take evening courses at St. Ambrose College and flight training at Cram Field. While Kapus worked and studied and the war intensified, famed flier Jacqueline “Jackie” Cochran was struggling with how to best suggest the use of female pilots as part of the effort. She’d already mentioned the idea to Eleanor Roosevelt back in 1939, but she was promptly turned down. Independently, pilot Nancy Harkness Love toyed with the same issue, proposing a program with the Army Air Corps Ferrying Command, but she too was denied. Their first efforts were turned down not because of lack of skill, but because of perceived lack of need. At the onset of the war it was assumed the United States had more than enough male pilots to do the job, and no one had yet seen a reason to believe otherwise. Fellow WASPs posing together in their flight gear. So, Cochran left the United States to offer her help as a captain with the British Air Transport Auxiliary in England, whose country’s dire circumstances left them open to accepting any pilots who could assist. By 1942, recognizing the ATA success with women in Europe paired with a decline in male pilot availability, General “Hap” Arnold, commander of United States Army Air Forces, rescinded his earlier denials and requested that Cochran and Love start ferrying programs stateside that employed women. Love assigned a small number of females to the Women’s Auxiliary Ferrying Squadron, putting the WAFS to use in ferrying new aircraft directly from factory to bases or ports. Cochran’s program was larger in scope, incorporating more women and broader flight-related duties. In August of 1943, the programs joined together to form the Women Airforce Service Pilots (WASP). 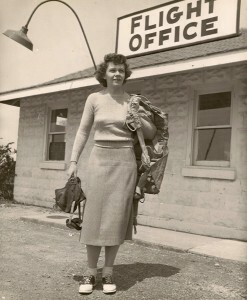 Kapus was keenly aware of Cochran’s new program, although she had not met the 200 flight hours requirement. Eventually, entry requirements dropped to 35 hours, at which point Kapus’ then-38:10 made her eligible. She applied and was accepted to the 44-W4 WASP class, and became one of only 52 of her original class of 104 to graduate from Sweetwater, Texas on 23 May 1944. She’d had three, nine week phases of training, with Primary phase requiring 70 hours in either a PT-19 Fairchild or a PT-17 Stearman, Intermediate phase needing 35 hours on the BT-13, 35 hours on the AT-6 the Texan, and Vultee instrument training, and finishing with the Advanced phase which worked with the largest aircraft, demanding 70 hours of cross-country flying, including two solo 1,000 mile flights. Aside from ferrying, WASPs delivered a variety of cargo, flew tracking and searchlight missions, worked as instructors, and had the unenviable task of testing aircraft after maintenance, a job Kapus was well familiar with. Kapus was often asked to try out aircraft after parts were replaced, assuring good working order. Test piloting was a job male pilots notoriously spoke out against, believing that if they were going to die in an aircraft, it should at least be in combat. This hazardous assignment then often became the responsibility of the WASPs, and it was not one to be taken lightly. In one test flight, a mechanic asked Kapus if he could tag along since he had never been in a plane before. She invited him to test out the new engine, never guessing the mechanic’s first flight might very well be his last. While flying “fast time” the throttle got stuck, and despite both their best efforts, neither of them could free it. After radioing the tower for help, she was told to cut the engine and land in a nearby field. While neither was hurt in the incident, it obviously impacted the mechanic, who made certain to let her know that he was never going to fly again. Some women were not so fortunate as they had been, such as Kapus’ own roommate Mary Howson, who just prior to their graduation had crashed into another student during a landing, losing her life. Just when it seemed the WASPs had hit their stride, they were dealt a terrible blow. On 1 October 1944, each WASP was sent a letter from General Arnold, stating in part “…the nation can count on thousands of its young women to fly any of its aircraft. You have freed male pilots for other work, but now the war situation has changed and the time has come when your volunteered services are no longer needed.” He went on to state that if they continued they’d be “replacing rather than releasing” other men, a sentiment that would ring true for all women who were displaced from their wartime occupations—military and otherwise—once the men came home again. Kapus’ love for flight didn’t let this set back end her profession. Instead, she returned to Milwaukee and acquired her flight instructor rating, and taught pilots at what is now Timmerman Airport. In 1949, she was challenged by AmVets to break the world spin record, which stood at 48. After coaching and practice, she succeeded with room to spare, clocking a total of 64 spins. She later unofficially smashed her own record, performing an unbelievable 73 spins. 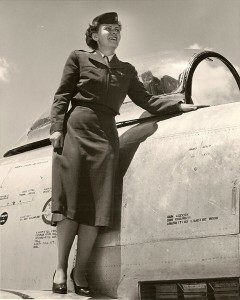 Kapus was also one of the first women in the state to enlist in the United States Air Force in 1947. During the Korean War, her request to fly was rejected, instead she served in personnel. She continued to dedicate the next two decades of her life to the Air Force, retiring as a Lieutenant Colonel in 1972. Jeannette Kapus passed away in Germantown, Wisconsin at the age of 88 in 2009, one and a half years before she was inducted into the Wisconsin Aviation Hall of Fame. Thankfully, she shared her unique story during her lifetime, and has left extensive information on her days as a WASP in the Wisconsin Veterans Museum archives. Jeannette Kapus’ uniform and beret are also on permanent display as part of the Museum’s 20th Century gallery.